Why spend $100 on a ticket to see a film that you have on DVD in both normal and special extended edition? Because it is absolutely brilliant, that’s why. 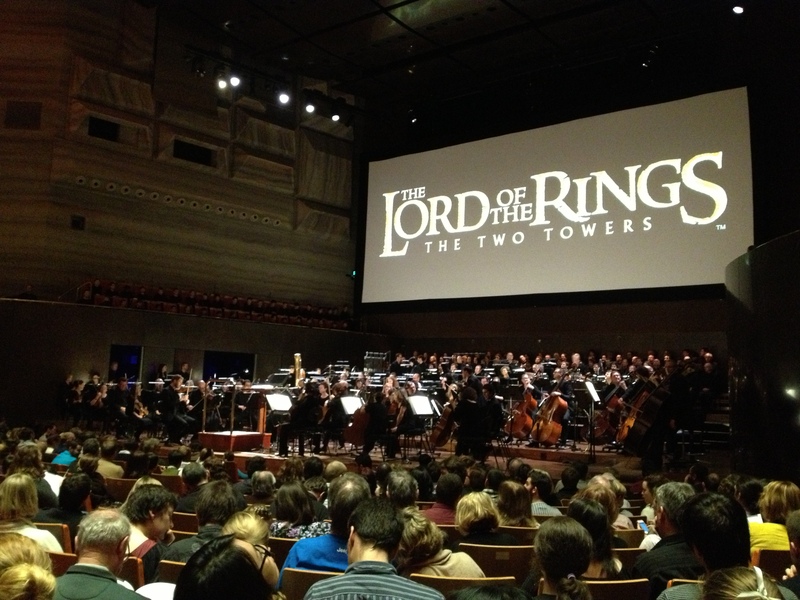 In October last year, we saw Fellowship of the Ring with the Melbourne Symphony Orchestra, and this year, it was time for The Two Towers. TTT is probably my favourite overall film of the LotR trilogy, and the music, especially in the second half of the film, is spectacular. I also love seeing these films on the big screen, as I didn’t when they first came out. The first half of TTT is really just setting up what it to come after interval (interval was placed between Frodo and Sam being captured by Faramir, and the Wargs attacking the Rohirrim on their way to Helm’s Deep), and musically, the only new theme that isn’t carried over (although broken up and re-arranged) from Fellowship the Rohan Fanfare. The second half contains the beautiful Aragorn and Arwen’s Theme, The Host of the Eldar, The Last March of the Ents, and of course The Tales that Really Matter. I love the second half of this film, the relationship developments between Aragorn and Legolas, Merry and Pippin and of course, Sam and Frodo, getting to see Captain Faramir’s “show is quality”, Gandalf and the Rohirrim showing up at just the right moment…I could go on. I love the MSO, and today they were as good as ever. Special shout-out to Colin Curry and the whole percussion team, who really had their work cut out for them in this film (there’s a lot of orcs!). The Royal Melbourne Philharmonic Choir was brilliant, as were the National Boys Choir of Melbourne. Boy-soloist Julian Dodds was excellent, and mezzo-soprano soloist Victoria Lambourn’s vocalising throughout the film was very good, but her rendition of “Gollum’s Song” during the final credits was a bit flat. Conductor Ludwig Wicki was full of energy, and brought the best out of the MSO. I suppose the only way to conclude is to say that after the show, we went and queued up at the box office and bought tickets for Return of the King, which is conveniently on my birthday next year. Can you give bigger praise than that? PS: To anyone who loves any film as much as I love the LotR trilogy, if your local orchestra is playing the music alongside the film, then do yourself a favour and get a ticket. You will not regret it. 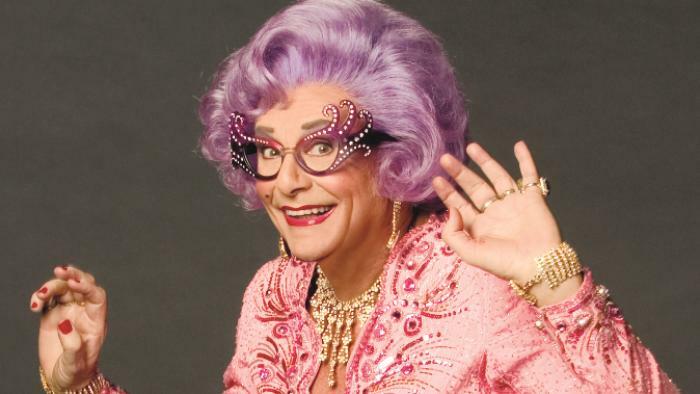 Tonight (Saturday 22 June), as 8pm AEST/11am GMT, the Sydney Symphony Orchestra is teaming up with classic Australian icon Dame Edna Everage (Barry Humphries), to perform some of the most well-known pieces in the classical repertoire . This performance will be broadcast live from the Sydney Opera House on ABC Classic FM (105.9 in Melbourne) across Australia and online, and there will also be a LIVE video stream of the show. Please note: Although many of the pieces mentioned are usually for children, the show IS at 8pm, and not a matinee for a reason, and with narration by Dame Edna, you never know what you might get (other than a fantastic evening)! Ennio Morricone’s score for The Mission. I must admit to never having heard of the film, let alone seen it, but I do believe I recognise some of the music, and it is FANTASTIC. Full information on the ABC Classic FM Classic 100 can be found here. Annoyingly, I can’t remember everything I voted for, but at least five of my ten votes made the Classic 100 (it was so hard to narrow my choices down to just ten!). A brilliant weekend of music. I love movie soundtracks, and I know I am far from being alone in that category. Over this Queen’s Birthday long weekend, ABC Classic FM are having their annual Classic 100 Countdown, and this year’s theme is Music of the Movies. Their listeners nominated and voted for the music. The rules were that it had to be either an original score for the movie, or classical music used within a movie. As I write this, I am listening to No 60. Beethoven Symphony 7, as used in The Kings Speech, and, I can happily say, was one of the ten pieces of music I voted for (you got ten votes). Good film music becomes inseparable from the film itself. Themes from films are some of the most iconic pieces of music ever written. Think about the James Bond Theme, Harry Potter Theme, Psycho Theme and Jaws Theme. You know these themes instantly, even if you haven’t seen the corresponding film. My favourite soundtrack ever would have to be Howard Shore’s soundtrack for Lord of the Rings. 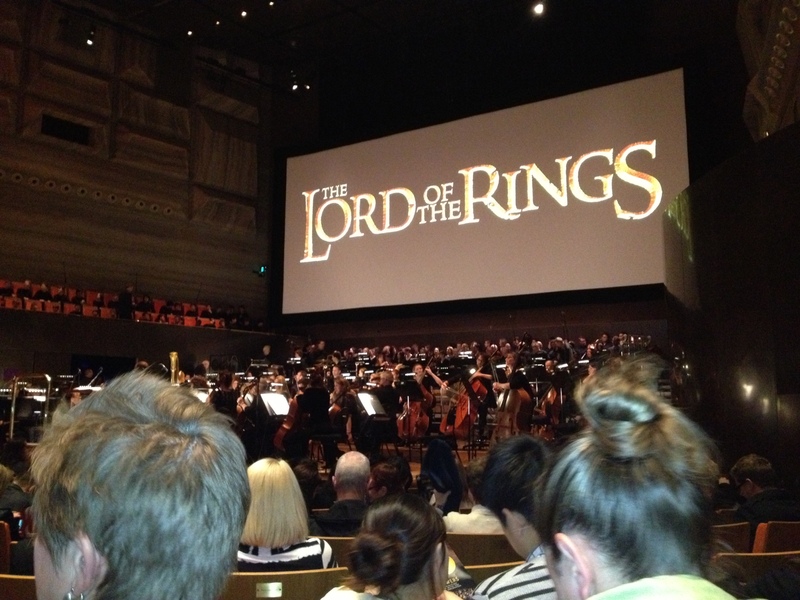 Last year, I saw the music for Fellowship of the Ring performed live with the Melbourne Symphony Orchestra (photo below), and in July I’ll be seeing The Two Towers with the MSO. I don’t think there is any other film I would rush out to buy tickets to see the soundtrack live. Seeing FotR like that was so amazing, bumping into the Top 5 Things I’ve Ever Seen Live, and I know that TTT will be just as good (not least because TTT is my favourite overall film of the trilogy). My other top soundtracks include: Atonement, Pirates of the Caribbean, Thor, Cloud Atlas and Cinema Paradiso. My favourite songs from films include Skyfall, Star Spangled Man (Captain America) and Young and Beautiful (The Great Gatsby). If the ABC Classic FM Countdown isn’t enough Soundtrack music this weekend, last night’s Friday Night Is Music Night on BBC Radio 2 was celebrating the Great Film Composers. In the 2011 BBC Proms season, there was a Film Music Night, and the whole thing can be watched here. This would be in my top 10 favourite Proms (the James Bond suite is fantastic). Still need more? Avengers star Tom Hiddleston posted last night a link to the Hiatus Soundtrack Mix. There are some amazing pieces to be found in that.